A Swedish lawmaker on Friday nominated the jailed former leader of the pro-Kurdish Peoples’ Democratic Party (HDP) Selahattin Demirtaş for the 2019 Nobel Peace Prize, left-wing news site Gazete Duvar reported. Thomas Hammarberg, a Social Democrat and human rights advocate, nominated the 45-year-old Demirtaş, who has been behind bars since November 2016 and faces up to 144 years in prison over a string of terror related charges, for being “courageous” and “promoting peace” in Turkey, the site said. 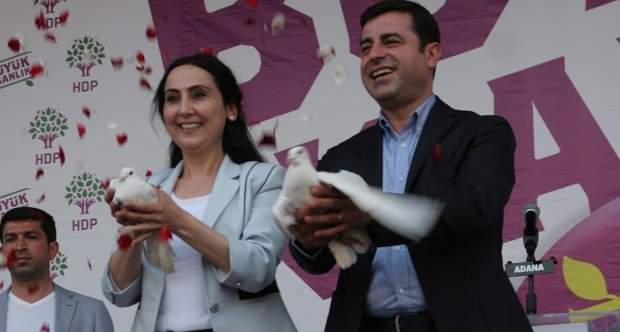 “For the last twelve years, Demirtas has played a key role in almost every initiative in Turkey promoting peace between Kurds and Turks, minority rights, women rights, gay rights, and democracy,” Gazete Duvar quoted Hammarberg’s letter that was submitted to the Nobel Committee as saying. “He has been constant and courageous in his work for a peaceful solution of Kurdish question. He has worked for an end of warfare against Kurds in Turkey and Syria,” the letter went on to say. Demirtaş is one of eight HDP lawmakers currently behind bars in Turkey on terrorism-related charges after the lifting of their parliamentary immunity in May 2016, following the breakdown of an HDP-mediated peace process between the government and Kurdistan Workers’ Party (PKK) armed rebels. Ankara accuses HDP politicians of aiding the PKK, an armed group that has been at war in Turkey for more than 30 years and is designated as a terrorist organisation by Turkey, the United States and the European Union. Demirtaş led the HDP’s presidential and parliamentary election campaign from prison in June 2018, securing 65 seats for the pro Kurdish party — up from 59.